Intervention and Prevention of Ongoing Diseases — I.P.O.D. Remote Area Medical (RAM) – Free Medical Care April 5-7, 2019! The Ashtabula County Health Department can now issue Birth Abstracts for anyone born in the State of Ohio from 1909 to present date. We have been granted Statewide Birth Issuance from the Ohio Department of Health Vital Statistics Office as of December 2010. 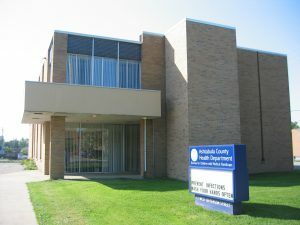 The Ashtabula County Health Department can issue Death Records from the Ashtabula County General Health District from 1909 to present date which includes all of Ashtabula County with the exception of Ashtabula City and Conneaut City. Death Certificates are filed according to where the death occured. Certified copies of birth and death certificates have a raised seal and are stamped by the Registrar of Vital Statistics. Birth Certificates: A written request must contain the full name at birth, date of birth, place of birth, father’s name, father’s birth state, mother’s maiden name, mother’s birth state, name, address and phone number of the person making the request, signature and a return mailing address and phone number. Please send a check or money order for the amount necessary along with a self-addressed stamped envelope. Death Certificates: A written request must contain the full name of the deceased, date of death, place of death, name, address and phone number of person making the request, a signature and a return mailing address and phone number. Please send a check or money order for the amount necessary along with a self-addressed stamped envelope. Please see the instructions below to request a certified copy either “By Mail” or “In Person”. Certified copies may be requested by first class standard mail. The fee is $25.00 each. (We DO NOT accept credit cards and NO PERSONAL CHECKS for request by mail). CASH, CERTIFIED BANK CHECK, or MONEY ORDER ONLY. There will be a returned check fee charges by the Treasurer’s Office per ORC Section 321.48 for all returned checks. For a quicker return, please enclose a PREPAID, SELF ADDRESSED U.S. Postal Priority Mail Envelope and your birth/death certificates will be returned to you. Certified copies are $25.00 each. You may come to the office and purchase a copy of a birth or death certificate any weekday from 8:00 am to 4:00 pm. (Closed all legal holidays) We DO NOT accept credit cards. We will accept Cash, Local checks or Money Orders ONLY. There will be a return check fee charges by the Treasurer’s Office per ORC Section 321,48 for all returned checks. If you were adopted you will need to request your birth certificate from the Ohio Department of Health. After an adoption, the original birth record and all other legal documents related to the adoption are sealed and are not accessible except under certain procedures specified by state law. CLOSED ALL LEGAL HOLIDAYS - Click here to see all Holidays for this year.